This little fellow was about three days old when I took this picture. My friends Gretchen and Randy, who live just down the road, acquired five fine fat sheep a few months back. They were told that one or two of them might be pregnant, but the vet couldn't tell. Sure enough, last Thursday morning when they went to visit, two newborn lambs had joined the flock. Apparently it's a good thing to handle the babies - I guess they need to get acclimated to humans - but the mom sure didn't like it. Please please take a look at these photos I took - I adore these sheep with their hilarious faces, their way of racing around in a pack, and the wonderful baaa-ing! They're some of my favorite photos yet! Sharon CT Daily Photo turns one year old on March 30 - how shall we celebrate? "Little lamb, who made thee? Sost thou know who made thee?" Can't help but think of Blake whenever I see one. 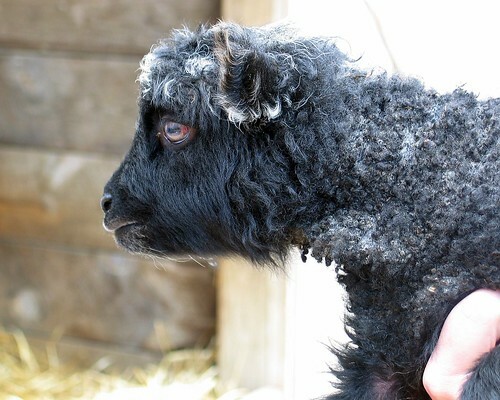 This little lamb is very attractive! very cute photo series. I love The Girls. Oh how sweet; just makes me want to cuddle it! I want one, I want one and just in case it's not clear I WANT ONE!!! Anyway, I send you a big kiss. Very cute indeed & so many different colours. They do have great eyes, don't they? And the paschal week approaches. Just three days old! I would have guessed older, but then I know pretty much nothing about baby (farm) animals except maybe kittens. I'm learning a little though, living in the country in Switzerland like I do right now. Hey, congrats on your upcoming blog birthday!